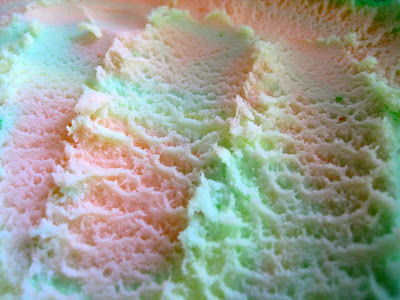 Sometimes, some scoopfuls of old fashioned rainbow sherbet that comes in a giant tub that you picked up at a big box store, is all you need to satisfy your cold treat need. I can’t get enough of this right now. It’s a good thing that tub is so giant. I LOVED Rainbow Sorbet as a kid and that picture totally brings me back to being 10 years old and eating out of the Dreyer's tub in front of the TV! Ah…the good old days!